Icon Student Spaces is pleased to offer members of our apartment community amenities that make life easier. Having 3 on-site laundry facilities is definitely one of the perks of living here. What a wonderful thing it is to not have to drive all over St. Louis, MO looking for a clean, affordable, open laundromat on a Saturday night! Today in our blog post, we’re going to share some laundry day tips and laundry facility etiquette to make something good even better! Print out a basic stain removal guide and hang it on your hamper, that way you will have the solution you need to pretreat stains right after they happen. For more in-depth stain removal information refer to this Stain Solutions Guide, put out by the University of Illinois Extension Office. To keep hampers smelling fresh: Fill a knee-high (or cut off) nylon stocking with baking soda. 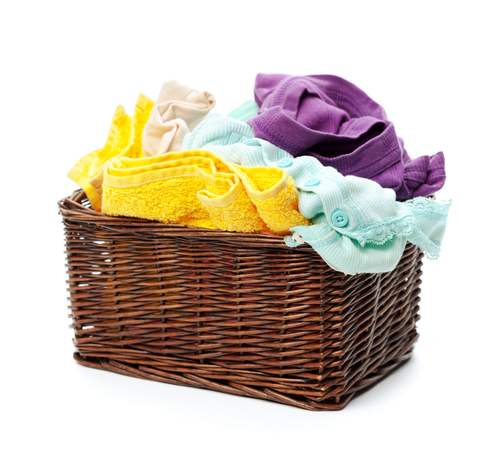 Knot the open end and hang inside the hamper to absorb odor; replace about once a month or as needed. Turn your jeans and other dark colored items inside out to wash —this will help slow down fading. When you load the washing machine, make a note of anything that can’t go in the dryer on your phone’s note feature, when you switch your laundry, refer to your list to pull out the items that need to air dry. Throw a dry towel into your dryer with wet laundry — it will absorb moisture and speed up the drying process. Pre-sort your laundry by using a three-bin hamper for darks, lights, and colors. This will save you time and energy when it’s time to haul the laundry to the laundry center. We suggest using a foldable wagon to get it from here to there. Be aware of how long it takes to do your laundry and plan accordingly. There’s nothing worse than arriving at the laundry center without enough time to get everything dry. If you must leave and come back, set a timer on your phone so you can arrive in time to empty your washer on time. Be courteous to other members of our apartment community and clean up after yourself. Be especially careful to clean up any spilled bleach so as not to ruin your (or anyone else’s) clothing with bleach spots. Use laundry time to multi-task. It is a great opportunity to read a book, complete some homework, or get to the next level of your current game.